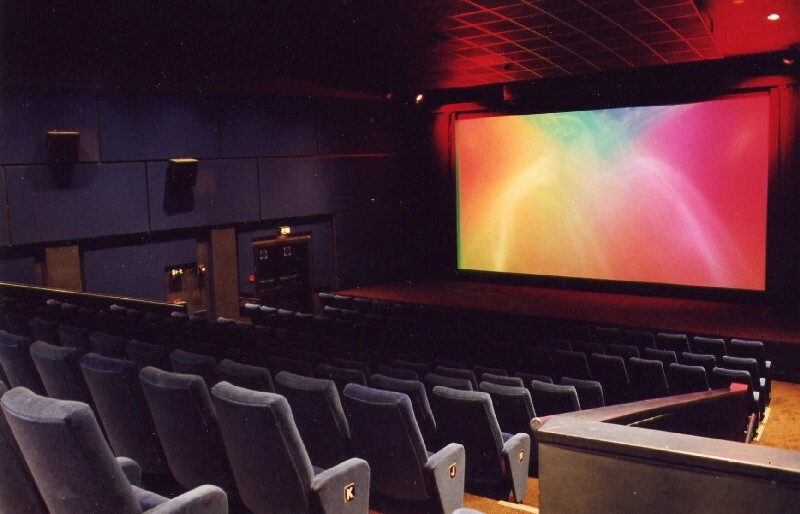 Opened on the 14th of January 2000, City Screen York is owned and operated by City Screen Ltd, who own and manage another 12 sites and programme various other venues. It is a three-screen venue, which also has a busy Café-Bar, art gallery and Basement Bar, used for Live Music and other events. All screens have stadium seating and Dolby Digital sound. Screen 1 is also one of only 17 U.K. THX certified auditoriums*. Screens 1 and 2 are equipped with two projectors enabling changeover shows to be performed for screening archive prints etc. Being a fan of 70mm and large screen formats for many years, I wanted to upgrade Screen 1 to 70mm as soon as I was given the chance. In December 2001, after a conversation with Tony Jones (Co-Director of City Screen and a 70mm fan himself), he gave the go ahead: if I found a suitable projector we could upgrade screen 1. So at the start of January 2002 I began the search. 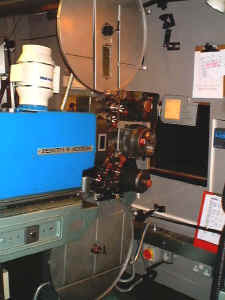 A Cinemeccanica Victoria 8 projector (able to show 35mm and 70mm) was the ideal choice to replace one of our Cinemeccanica Victoria 5 projectors (35mm only). It meant we were able to swap the lens turret and reverse scan sound readers from the Vic. 5, straight onto the Vic. 8. Myself and Charlie, one of my projectionists at City Screen, went to view a Vic. 8, which met all our needs. It came with all the 70mm gate parts, two Magnetic sound penthouses and more importantly, it ran perfectly. So after discussion with Tony Jones, a deal was made, and we took delivery of the Vic 8 on the 14th January 2002. The projector required new electrics and the whole of the pedestal re-spraying. This meant the electrics for all the Vic. 8's in the City Screen chain were the same. This design also provides the relevant inputs and outputs for any Dolby CP, automation system, projector change over system and a motorized turret if required. Apart from the projector, we needed a larger lamp-house, another lens, additional sound equipment and the platter upgraded to 70mm. We had a Cinemeccanica Zenith 4000H lamp-house within the company, where another site had upgraded to a 6500H. We collected this from the City Screen equipment store. An unused 100mm focal length lens was also found there. Once the projector pedestal came back from the sprayers, we assembled the projector and installed the new electronics. We removed the Vic. 5 and wanted to get the Vic. 8 running ASAP so that if the other Vic. 5 in Screen 1 failed, we would have a backup. This was a wise choice as a freak Xenon failure happened 5 minutes before a late night show later that week. Initially it was only installed with the original Cinemeccanica CX16H lamp house from the original Vic. 5, and only with Analogue stereo. To test the Vic 8 installation we ran the adverts and trailers on a spool and changed over to the Vic 5 for the feature. This was so the feature film would be shown with digital sound, (which the Vic 8 didn't have installed at the time). We had a shutter in stock at our Stratford East cinema in London, so this modification was carried out with no cost to us. A Magnetic Pre-amp was also found at the Stratford East cinema along with spare sprockets for the Projector. Once we had the projector up and running I swapped both the analogue and digital reverse scan sound readers from the removed Vic 5 to the Vic 8. A basic sound alignment to get analogue and digital sound working was carried out and Future Projections were called to calibrate the Vic 8 sound fully. To test the 70mm sound and picture, we used some reels of an original print of 'My Fair Lady'. Although this has faded to pink, the picture quality amazed anyone who was lucky enough to be in the cinema in those early morning test sessions, the first of which was on 2nd April 2002. The ZX4000H was fitted in time for the release of 'Minority Report' with a 3K lamp and the projector was fully aligned. Future Projections completed the sound alignment at this time also. The projector was now fully operational for 35mm film presentation. The Dolby sound Processor used in Screen 1 is a CP65, and to be able to run 70mm Dolby films with either 'A' Type or 'SR' noise reduction we were advised to use external noise reduction units since the CP65 can't provide 4 channels of true SR for use with Magnetic soundtracks. So Future Projections supplied me with Dolby Cat 364 single channel noise reduction units. These use Cat 22 'A' Type cards or Cat 280 'SR' cards. The CP65 therefore isn't required for any noise reduction; only the sub bass filtering on the CP65 is used. 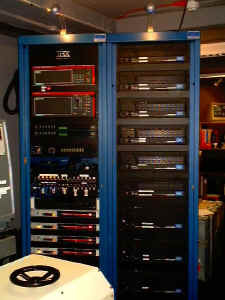 We also installed a patch bay between the outputs of the Cat 364 units and the CP65, so we can configure for Dolby and non-Dolby 70mm sound formats. (We don't have the LE and RE channels behind the screen). 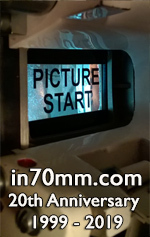 The 70mm was tested with other reels of 70mm films, which were loaned to me by Mr. Howard Ellis. These included reels from 'The Mission', 'Return to Oz' and some 70mm simulator ride films. We use Cinemeccanica CNR3/35 platters in all three screens of the cinema, so when we needed to upgrade screen 1's platter to 70mm, we had the choice of buying another platter or upgrading our existing platter to 35/70mm use. The latter option was to be the cheapest and it would keep all three screens platters the same and easy for training etc. To upgrade a platter to 70mm isn't a common request so we contacted Nigel Shore at NSS Imaginering, a Cinemeccanica expert, to supply the required roller shafts, roller spacers and take up rings. The 70mm feeder was supplied from our 'Harbour Lights' cinema in Southampton which had two 70mm feeder units. All the platter parts were ordered in June 2002. We had the projector up and running and tested on both 35mm and 70mm. The sound system was complete and tested for 70mm so we were just waiting for the platter parts to arrive. Future Projections supplied the wall mount film transport rollers and I fitted these ready for the platter film path to be fully aligned for 70mm use. In early August I also gained another spare Magnetic Penthouse from an old Odeon projectionist, so we now have 2 spare complete Magnetic Penthouse sound readers. If we were to open the 70mm in 2002 we had to program a film in for October between 'The Road to Perdition' and before 'Harry Potter Part II'. Myself and the other Projectionists who have being helping with the installation (Justin and Charlie) settled on using '70mm High Definition Cinema' as the tag line to use for all our 70mm presentations, and we produced a short DVD promo for 70mm to show during the adverts and trailers in the cinema. The 70mm take up rings and roller shafts finally arrived and the spacers followed a week later. 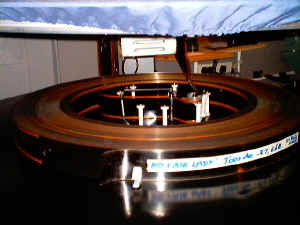 The platter was taken apart and serviced, leveled and then re-timed for the faster 70mm film speed. On the 13th of September, we ran 3 reels of 'My Fair Lady' from the Platter without any problems. Technicolor Labs, London, kindly donated platter lacing, and academy head leaders for us to use. The installation was then complete, and we are picking up the print of 'Lawrence of Arabia' on the 27th of September. All the projection team, and all who have been involved in the task of bringing back 70mm for audiences to enjoy in the York area, are looking forward to the first show on the 13th of October 2002. There are pictures to accompany this article of the installation and after the opening show, pictures of the first show. 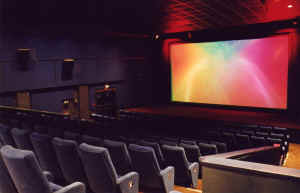 If anyone reading this is ever in York please don't hesitate to contact us for a tour around the projection facilities. * as per the THX Theatre list summer 2002.